November 1, 2018 – Over my 31 years at Krause Publications I’ve heard many funny catch phrases emerge, particularly at times of great deadline pressure. When I inevitably pushed the deadline past any reasonable human limits, I remember Clifford Mishler, then publisher of numismatics, asking me “Will this sell one more book?” Of course, I didn’t care about sales; my work was to make the book the best it could be. In doing that, I felt, I could best benefit both the customers and the company. Once, minutes after the negatives left for the printer, Carolyn Borth, then our AS-400 pro and page running champion, quipped my favorite quote “On time, every time, by the time we’re out of time” We always pushed the deadline to make the book the best it could be, but from my first years on, Colin Bruce II, longtime editor for the Standard Catalog of World Coins series, always soothed my agitation by reminding me than there would always be another opportunity with an annual title. “There’ll be another book next year” he would say and there always has been. 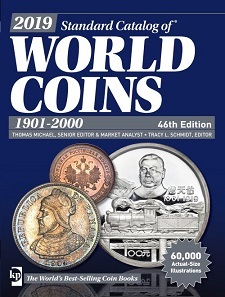 Thomas Michael and Tracy Schmidt, 2019 Standard Catalog of World Coins, 1901-2000, 46th Edition. Iola 2018. 2384 pp., fully illustrated in color. Paperback. 21 x 8.3 x 27.6 cm. ISBN: 9781440248580. 70 USD. This years’ Standard Catalog of World Coins 1901-2000 46th edition offered me a rare opportunity. Relative stability in the market the last few years has allowed me to concentrate on some of the narrow areas of numismatics which often get overlooked, as well as developing sustaining database elements which will help to keep our catalog healthy for years to come. Mint and proof sets were examined a little more closely this year, verifying descriptions and updating values. The market discovered the true rarity of the gold strikes of the nine piece World Fisheries Conference coinage issued in 1983-84. Mintages on these coins have always seemed misleading, some too high, some too low, based on their market appearances. When Heritage auctioned a full set last fall, bidding was so serious that we can all now be assured that these coins are exceptionally scarce! Don’t write me asking if the jumps in value for these coins are realistic! Just trust that in most cases I had never seen any of them offered, period, in thirty years. Given these developments in modern gold series, I took some time this year to expand our value listings for the gold Conservation series strikes from 1974-78 also. You might guess, correctly so, that these issues are fairly common. In many cases you would find that ordinary looking examples in MS63 or PF63 are so common as to be selling at auction close to or slightly below their melt value. However, when working my way through auction results it became quite clear that some very strong premiums were being paid for the best available grades of many Conservation types, so we added MS66 and Pf67 and PF69 values to many of these types, reflecting the realities of life for those collectors offering or seeking the best. One thing folks may not realize is that, even though the page count for the SCWC 1901-2000 is not changing these days, we are still able to increase content through the careful tightening of images and data. Our designer, Sandi Carpenter, has become an expert at this process. Sandi was so careful this year that we were able to add photographs back into many of our larger pattern sections, German Empire for instance, which had been removed years ago to gain space for burgeoning content. Since we were able to do this, I of course pushed it a bit further and added in some new pattern listings too. In Qatar you will now see a full modern pattern listing with images. On the other hand, not all things we did this year for the SCWC involved additions. In an unusual twist we found that three overdates had to be removed from Ecuador. Hearing from Fernando Barciona, a collector in Ecuador about these three unknown overdates I contacted old friend Dale Seppa, author of many books on the coinage of Ecuador, for verification. After tracking down origins and corresponding with three additional experts, we all agreed that these dates had been added to the SCWC in error and did not exist, so they are gone now, removed from the database. In a second such instance, Ernie Mix took the time to verify the non-existence of several Mozambique listings for the 1981 date. Ernie was able to confirm in Mozambique that no 1981 dated coins of any type were ever issued. These probably got into the catalog through a mint record for coins struck in 1981, but not noted as using an earlier dated die. It’s unusual for us to remove listings, but I was comforted knowing that we have such great customers and contributors who care enough about the catalog to share their knowledge, even when taking bad data out. It’s this devotion to the SCWC that keeps all of us going sometimes! In fact, perhaps as a reflection of the stabile market conditions I mentioned above, I noticed that many contributors took time this year to review out of the way areas and finer points of data than they normally can make time for. Bill Noyes spent much time making notes on set listings to guide me through their revision, Melvyn Kassenoff added in mintages and checked listings for missing or errant dates, Scott Cordry made notes on many small areas which had little things out of whack, Al Beck corralled those illusive 1998 Hercules coins in Gibraltar and set their values back to proper proportions. Keep all of this in mind as you use the Standard Catalog of World Coins 1901-2000 46th edition this year. Be thankful for all the careful, trained eyes watching the SCWC regularly and keeping us on track. Consider, if you notice something amiss in the listings you use, contacting us with a correction or comment. Make participation a part of your routine – I’ll be pleased to hear from you. The book can be purchased on the ShopNumismaster website.